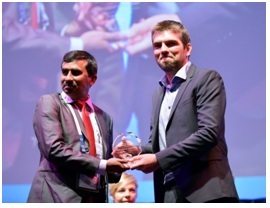 IAVP CONGRATULATES TO Dr Gowthaman Vasudevan, MVSc, PhD, Assistant Professor, Poultry Disease Diagnosis and Surveillance Laboratory, Veterinary College and Research Institute Campus, TANUVAS Namakkal, Tamil Nadu FOR WVPA-Zoetis Young Poultry Veterinarian Award. Dr Gowthaman Vasudevan, MVSc, PhD, Assistant Professor, Poultry Disease Diagnosis and Surveillance Laboratory, Veterinary College and Research Institute Campus, TANUVAS Namakkal, Tamil Nadu has been awarded The Young Poultry Veterinarian of the year 2017 by World Veterinary Poultry Association. The award was conferred to him in the World Veterinary Poultry Association Congress held at Edinburgh, United Kingdom on 5 th September, 2017. The WVPA-Zoetis Young Poultry Veterinarian Award was launched in 2012 and is awarded annually to a young (less than 35 years old) poultry veterinarian who is seen to be a credit to the profession, who is an ambassador and a communicator and who would be seen as a worthy winner by all sections of the poultry industry. The Award is judged by a panel of members of the WVPA and is led by the president of WVPA. The Awards is generously supported by Zoetis. The recipient of the Award receives $US 5,000 which to be used to attend scientific meetings in order to further develop their professional knowledge. The WVPA Young Veterinarian of the Year Award is presented at the WVPA’s biannual congress in the years it is held and at the WVPA Asia Meeting in the intervening year. Dr Gowthaman is the first Indian to get such prestigious award for his contributions to the field of avian pathology. He has been focusing his research interest towards avian influenza, respiratory-immunosuppressive diseases of poultry and food safety. Dr Gowthaman has got several peer reviewed publications on poultry diseases in reputed international journals. Presently, he is collaborating with University of Liverpool, UK in the field of avian infectious bronchitis. Apart from this, Dr Gowthaman is directly serving to the poultry farming community by disease diagnosis, treatment and control of economically important poultry diseases. These all credits fetched him this prestigious international recognition and award. Dr Gowthman was graduated from Madras Veterinary College, Chennai. He did his MVSc (from HSADL, Bhopal) and PhD from, Division of Pathology, IVRI, Izatnagar, UP. He is active life member of IAVP. Earlier, WVPA-Zoetis Award winners were- Dr Dennis Umali, Philippines (2016), Mr Maximillian Sim Kwang Hui, Malaysia (2015), Mr Adrian Knoetze, South Africa (2014), Mr Philip Hammond, UK (2013), Dr Kelli Holloway Jones and USA (2012). Details on how to apply for this award are notified to all national branches of WVPA, announced in the media and placed on the WVPA website http://www.wvpa.net/awards.php#young. 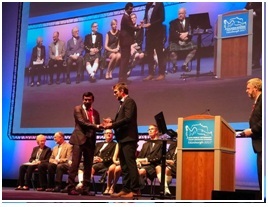 IAVP congratulates Dr Gowthman for this coveted international award and wishes him good wishes for future professional pursuits.